Generally speaking, the husband and I like to eat healthy meals to pretend we are offsetting the excessive caffeine consumption, beer calories, and late-night Netflix marathons. Other times, you just have to throw caution to the wind and eat a juicy, delicious, artery-clogging piece of red meat. Sometimes there’s just nothing better than a rich and meaty steak with a glass of red wine. It’s good for you in an entirely different way than kale, lentils, or blueberries. You’re probably wondering about the espresso rub, aren’t you? Well, it’s magic. 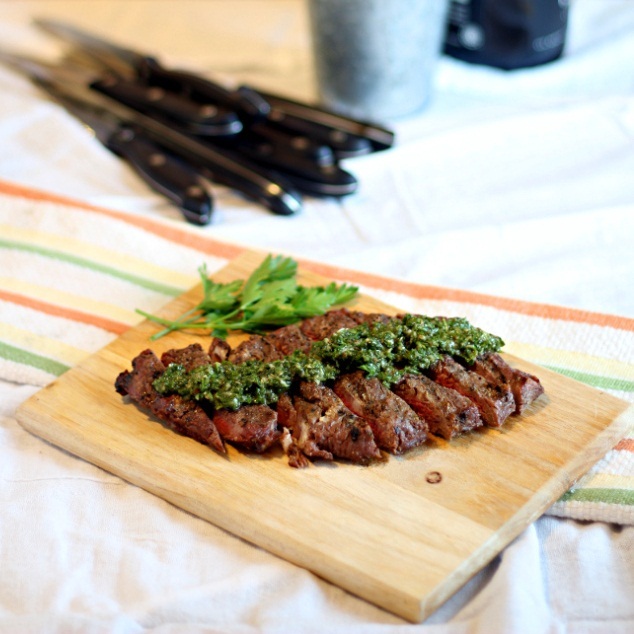 The espresso tenderizes the meat and adds a robust and earthy flavor to the steak. The steak is first scored by a sharp knife before you massage an espresso, chili powder, garlic, pepper, and oregano mixture into the shallow crevasses. 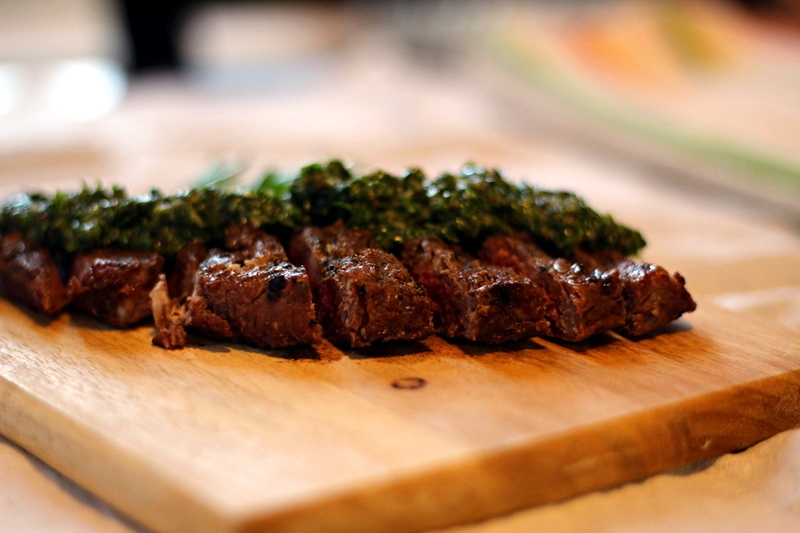 After being grilled over medium-high heat, you’ll top the steak with a fresh and fragrant Argentinian-inspired Chimichurri sauce made from parsley, cilantro, oregano, red wine vinegar, and olive oil. Steak is surely best served with a side of potatoes…. the recipe for these fluffy and crispy potatoes will come in a few days! After eating this meal the husband not only did ALL the dishes for me, but he also gave me full control over the remote control for the rest of the evening. Although, to be fair, he almost always does the dishes and I almost always monopolize the remote. The point is that this steak is absurdly tender, juicy, and delicious. So just make it, okay? Remove the steaks from cold storage and let come to room temperature for 15-30 minutes. In a small bowl, mix together the espresso powder, chili powder, garlic powder, oregano and black pepper. Rub the room-temperature steaks with the spice mixture and set aside for 10-15 minutes. Meanwhile, prepare the Chimichurri sauce. In the bowl of a food processor or blender, combine the parsley, cilantro, garlic cloves, dried oregano, red wine vinegar, salt, pepper, and red pepper flakes. Measure out the olive oil in a liquids measuring cup. Turn the processor blender on, then slowly drizzle in the olive oil until the contents reach a sauce-like mixture. Set aside to let the flavors mingle. Prepare a medium-high heat grill, or heat a use a grill pan coated with non-stick spray. Dust the steaks with the kosher salt, then grill 5-8 minutes per side or until done to your liking. Cover with foil and let rest for 5-10 minutes before carving crosswise into thick strips. Top with Chimichurri sauce and serve warm. 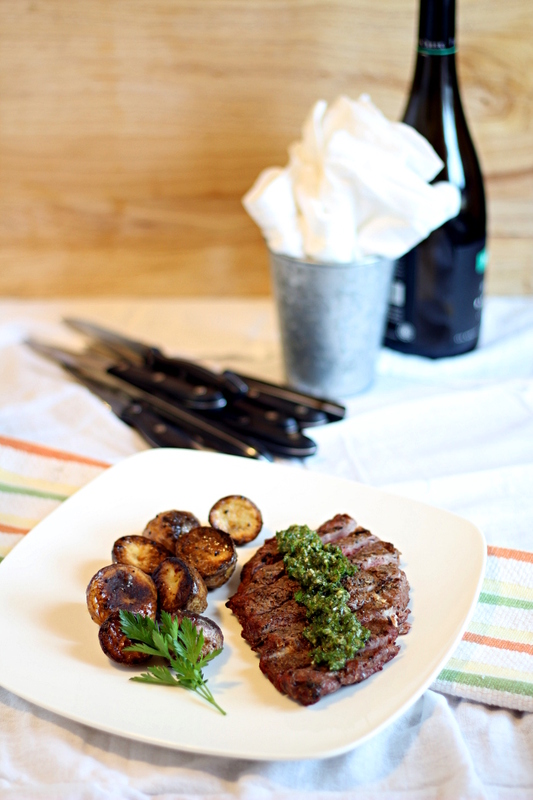 I love a good steak from time to time and this is a wonderful recipe, love the espresso rub! Great recipe and absolutely loving the new site! Thanks so much, Melissa! I've had a blast learning all of the ins and outs of the genesis framework - still have much to learn! Spot on recipe! Awesome flavor - thanks! I'm so glad you liked it, Jeni!